Sometimes the end of a product’s production run is surrounded by publicity, a mix of a party atmosphere celebrating its impact either good or bad, and perhaps a tinge of regret at its passing. Think of the last rear-engined Volkswagens rolling off their South American production lines for an example. Then again, there are the products that die with a whimper, their passing marked only by a barely visible press release in an obscure corner of the Internet. Such as this week’s discontinuances from Intel, in a series of PDFs lodged on a document management server announcing the end of their Galileo (PDF), Joule (PDF), and Edison (PDF) lines. The documents in turn set out a timetable for each of the boards, for now they are still available but the last will have shipped by the end of 2017. It’s important to remember that this does not mark the end of the semiconductor giant’s forray into the world of IoT development boards, there is no announcement of the demise of their Curie chip, as found in the Arduino 101. But it does mark an ignominious end to their efforts over the past few years in bringing the full power of their x86 platforms to this particular market, the Curie is an extremely limited device in comparison to those being discontinued. Will the departure of these products affect our community, other than those who have already invested in them? It’s true to say that they haven’t made the impression Intel might have hoped, over the years only a sprinkling of projects featuring them have come our way compared to the flood featuring an Arduino or a Raspberry Pi. They do seem to have found a niche though where there is a necessity for raw computing power rather than a simple microcontroller, so perhaps some of the legion of similarly powerful ARM boards will plug that gap. So where did Intel get it wrong, how did what were on the face of it such promising products fizzle out in such a disappointing manner? Was the software support not up to scratch, were they too difficult to code for, or were they simply not competitively priced in a world of dirt-cheap boards from China? As always, the comments are open. Header image: Mwilde2 [CC BY-SA 4.0]. The 86Duino Zero features, of course, an x86 Vortex86EX processor running at 300 MHz. This board also features 128 MB of RAM, 8MB of Flash and the usual compliment of Arduino pins in a Leonardo-compatible layout. Also on the SoC is a PCIE bus, Ethernet, a USB 2.0 host, and an SD card. There’s a lot of stuff on this board for such a small size. Compared to the gigahertz-fast ARM boards around, the 86Duino isn’t really that fast, but that’s not the point. There’s obviously a market for extremely tiny x86 boards out there as evidenced by the Intel Galileo, and this board is $30 cheaper than the Intel offering. There’s no video out on this board, so someone will have to figure out how to attach a graphics card to the PCIE connector before we build a miniaturized old school DOS gaming rig. Still it’s a very neat piece of hardware. If you need to have it now, here’s a vendor. Thanks [sohaib] for sending this one in. 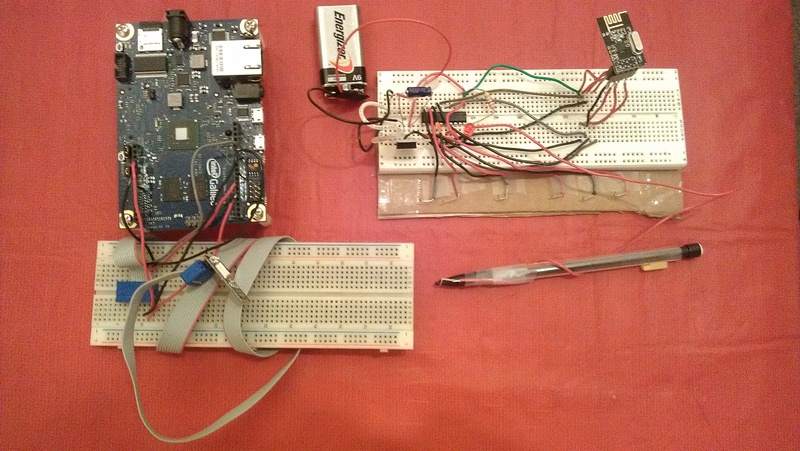 [Mark] recently finished his latest project, where he encrypts wireless communications between the new Intel Galileo and a Texas Instruments MSP430. The wireless interfaces used are the very common nRF24L01+ 2.4GHz transceivers, that had a direct line of sight 15 feet range during [Mark]’s tests. In his demonstration, the MSP430 sends an encrypted block of data representing the state of six of its pins configured as inputs. This message is then received by a sketch running on the Galileo and stored in shared memory. A python script then wakes up and is in charge of decrypting the message. The encryption is done using AES-128bits in Electronic Codebook mode (ECB) and semaphores are used to prevent simultaneous accesses to the received data. As it is the first project using an Intel Galileo we received, don’t hesitate to send us a tip if you found other ones.